Kate Middleton champions Emilia Wickstead at entrepreneur event | HELLO! The Duchess of Cambridge, née Kate Middleton, once again proved her on-point approach to style as she and her husband Prince William attended their final event in Mumbai. The royal couple were guests of honour at a gathering of young entrepreneurs in the city, and Kate perfectly fit the bill in a wool crepe dress by one of her favourite designers, Emilia Wickstead. 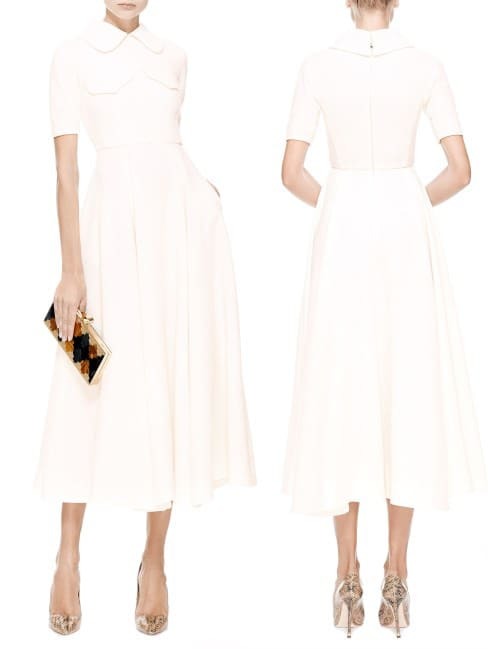 Originally on sale for £1760, the dress features a collar and chest pocket detailing, giving it an elegant but preppy look. The silhouette, with a fitted bodice and full sweeping skirt, is one that the Duchess is known to favour, and on this occasion she completed her look with a pair of Rupert Sanderson heels and a Mulberry England Bayswater clutch bag. It may well be that Kate requested a bespoke, lightweight version of the wool dress to cope with the hot temperatures in Mumbai. Emilia's feminine and timeless creations have proved very popular with the Duchess, and it is thought that she may well choose to wear another garment by the designer before the end of the royal tour. Just two days in to the official visit to India, and Kate has already showcased a cheerful selection of both British and Indian designers. She wore a striking sari-inspired Jenny Packham gown in a dazzling blue to a Bollywood gala on Sunday evening, and earlier in the day chose a striking mid-length pink and green chiffon dress by local Mumbai designer Anita Dongre.